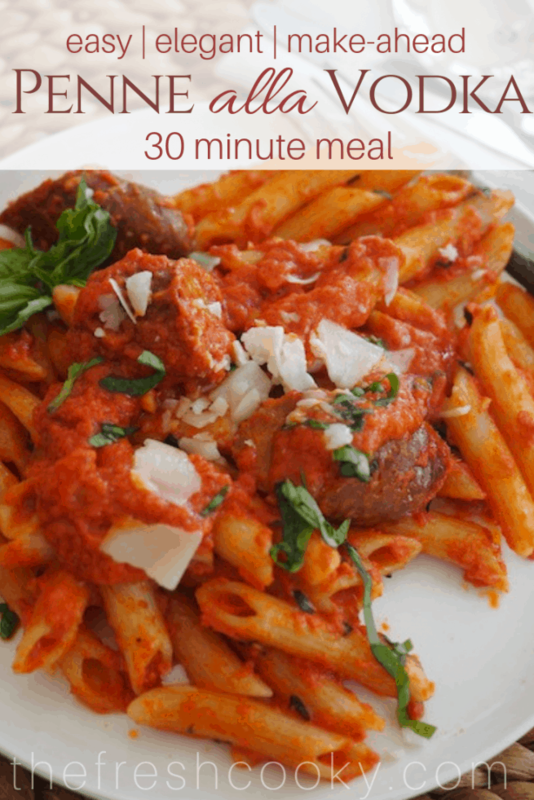 My Go-To Company-is-Coming Dinner, Ready in 30 minutes or less! This Penne alla Vodka recipe is my favorite, go-to, throw-it-together, last-minute have people over dish! I almost always have the ingredients on hand and it is ready in 30 minutes! Ripe tomatoes in a vodka butter cream sauce with basil and parmesan cheese for the finish. In fact, it’s so quick and amazingly delicious you’d think it takes hours to prepare, but you can even make it ahead of time! 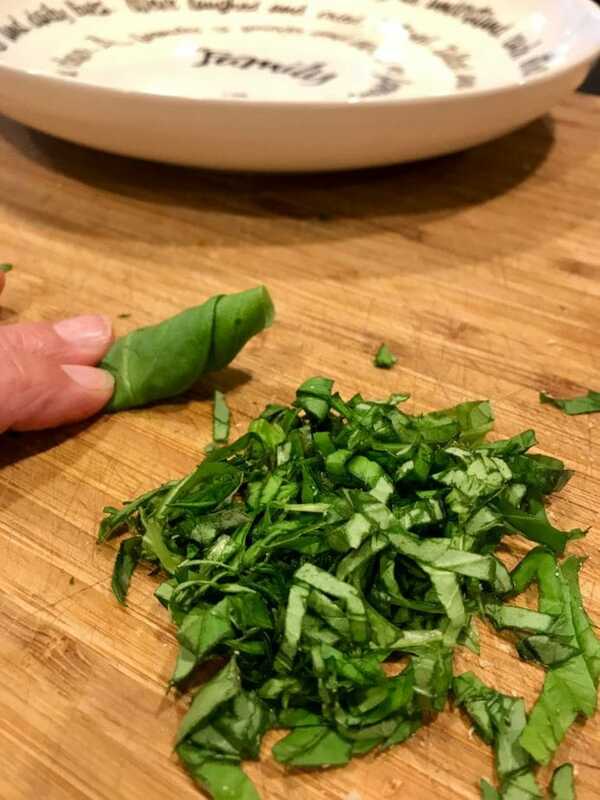 This meal is deeply satisfying, it’s wonderful in the summertime since you aren’t heating up the house; throw on some fresh basil from your garden and you’ve got dinner. Or make it in the winter when you need some delicious comfort food, spring and fall, you bet! Manga! Whenever you decide to make it, you won’t be disappointed! What a 4th of July! It was classic; hot, beautiful blue skies, burger smells all over the neighborhood! We so enjoyed our time in our neighborhood with fun runs, bike races, our own little home grown parade, a huge picnic and the best of all, pool games! We came home for a shower and rest, I convinced my husband to sit down with me in the middle of the day and watch Independence Day! 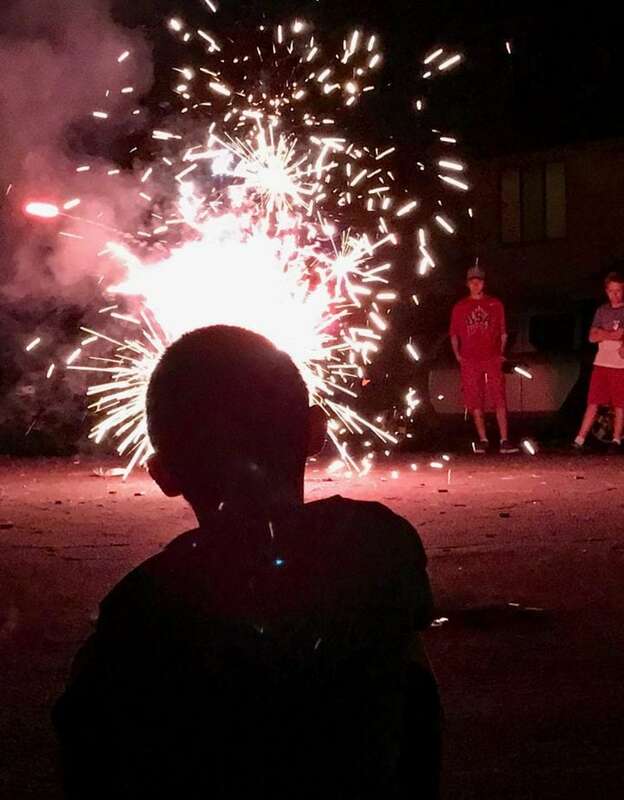 We finished off our evening sitting in the cul-de-sac with some friends letting our kids light our (legal) fireworks. But back to our recipe, this would actually be a great though different meal for the 4th since it’s a beautiful red color! 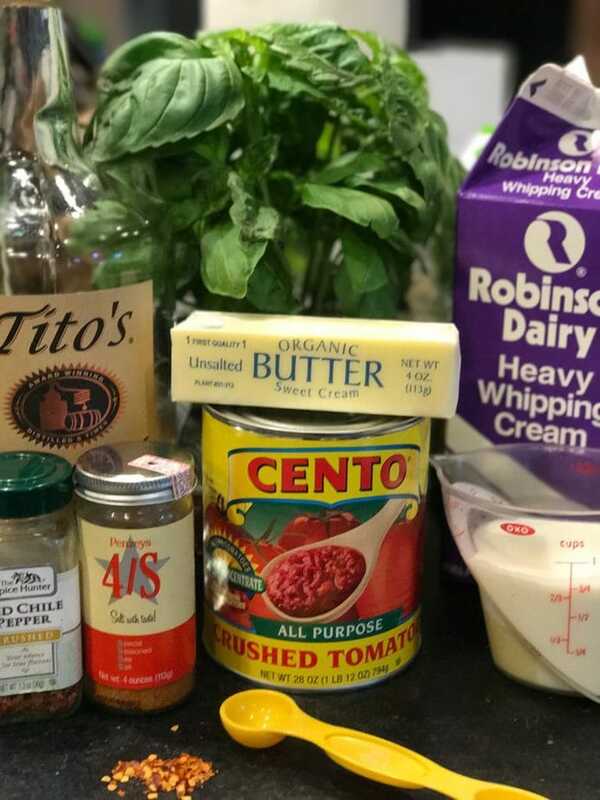 I generally have the ingredients on hand, the one that I might have to pick up is the heavy cream (you make it with light cream, probably, but why would you?) and the fresh basil. I almost always have tomatoes and parmesan on hand! TIP | You know you can freeze cheese right? Especially hard cheeses, they freeze beautifully. Wrap tightly in wax paper and then in plastic wrap, then store in freezer storage bag in freezer. Allow to thaw and you have fresh cheese every time. Start by throwing your butter into a large sauce pan, melt and add your red pepper flakes, add more if you like more heat, but as I’ve stated I’m a wimp and just like a touch of heat. Start water boiling for penne. 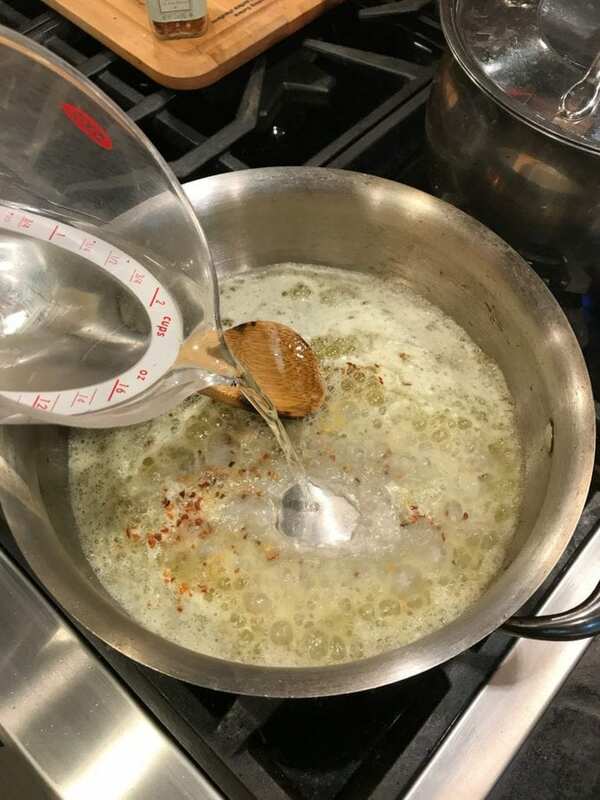 Next, carefully pour in your vodka, it will boil violently initially, allow to boil down and simmer for a few minutes until reduced about half. And your cream, stirring gently to combine. Add seasoning salt, stir to mix and simmer for 5-10 minutes. 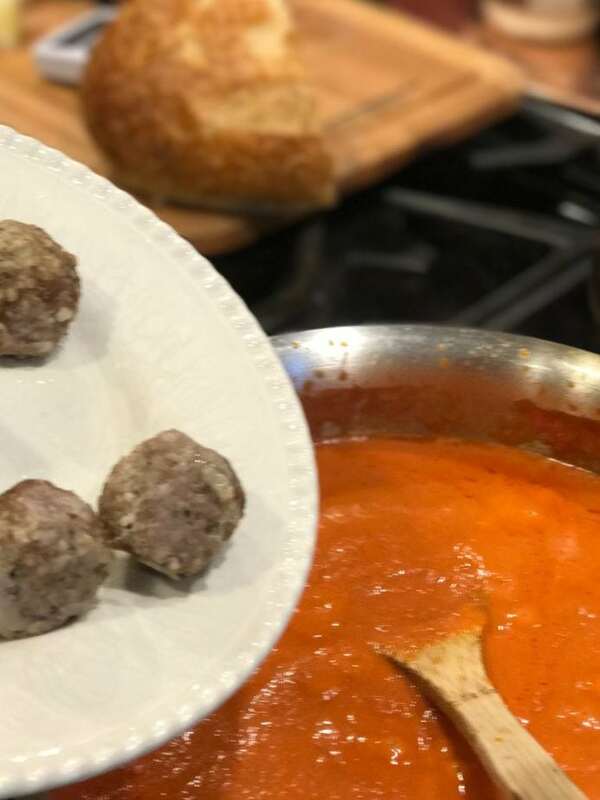 Sometimes, I want a bit more protein for my family, so if desired, add cooked meatballs or Italian sausage to the sauce and bring to simmer. Great time to add your pasta to the boiling water and boil according to package directions, al dente. Once sauce and meat is heated through, add additional seasoning if desired. 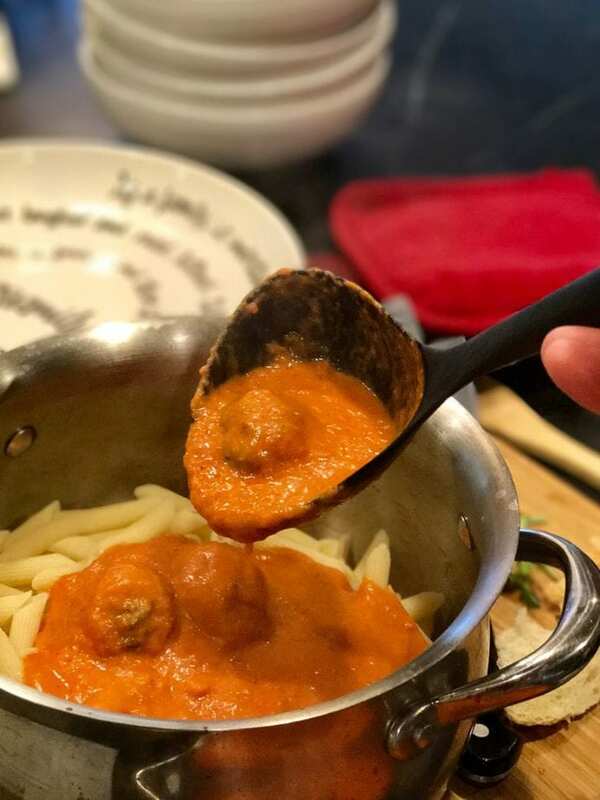 Return your pasta to the pot and pour several scoops of sauce over pasta, mix to combine…this makes a lot of sauce, sometimes we won’t use a whole pound of pasta so I’ll reserve and freeze the leftover sauce so I have another quick meal for sometime in the future. Toss in basil and grated cheese, stir to combine. Serve immediately with a crusty loaf of bread, crisp green salad and a crusty teenager…no? 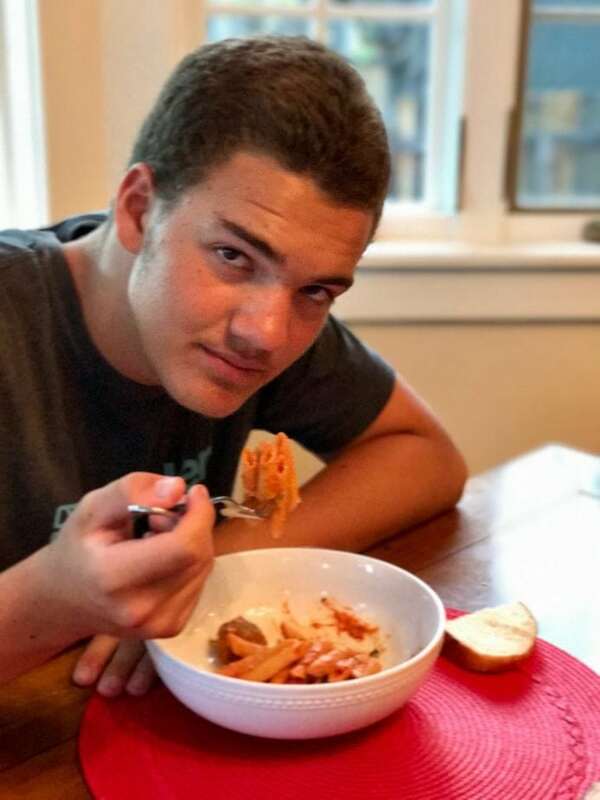 Oh, well okay my crusty teenager loves this dish though and I’ll keep him, even if he eats with his elbows on the table and doesn’t put his bread in his bowl. We’re raising wolves here! Serve hot with extra shaved cheese, grind a little additional salt and pepper if desired. A delicious and elegant meal ready in 30 minutes or less. 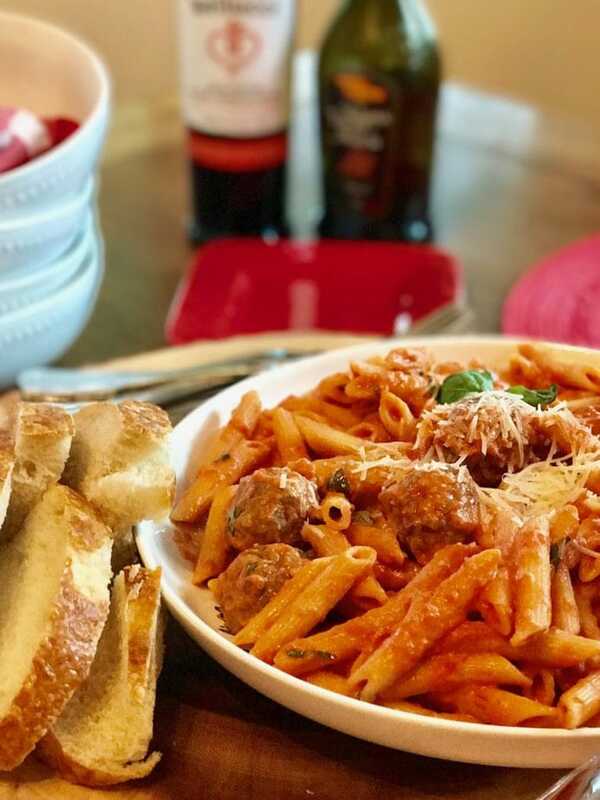 This recipe for Penne alla Vodka is the perfect company dinner! Rich, tomato vodka cream sauce covers penne pasta with parmesan cheese and fresh basil. Stir in red pepper flakes and vodka, vodka will boil violently. 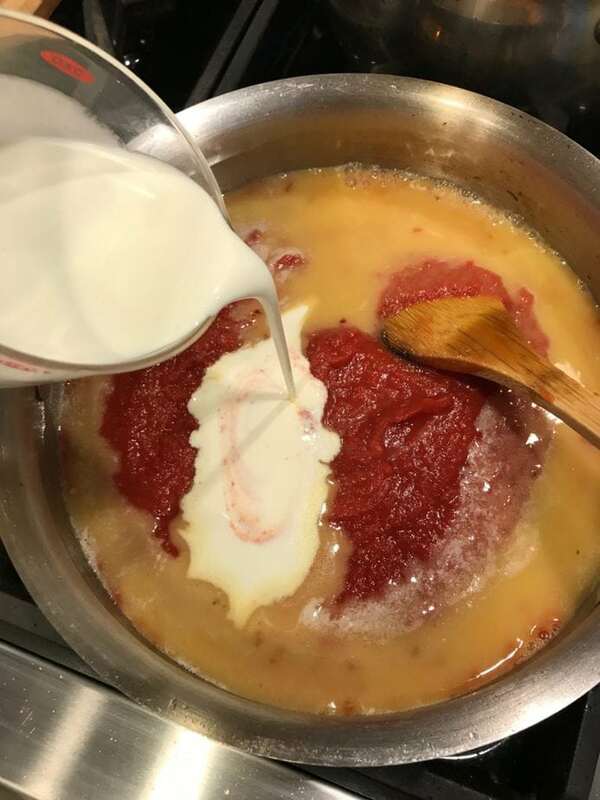 Stir in crushed tomatoes and cream. Add seasoning salt and stir well. If desired, add cooked meatballs or Italian Sausage pieces for extra protein. Cover and simmer until warmed through. 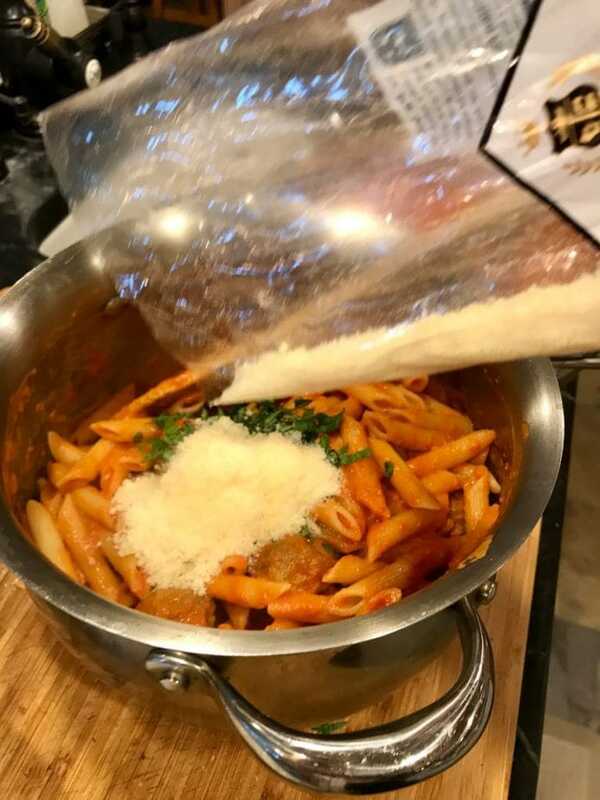 While simmering, cook pasta according to package directions. While pasta is cooking; chiffonade or chop of your basil. 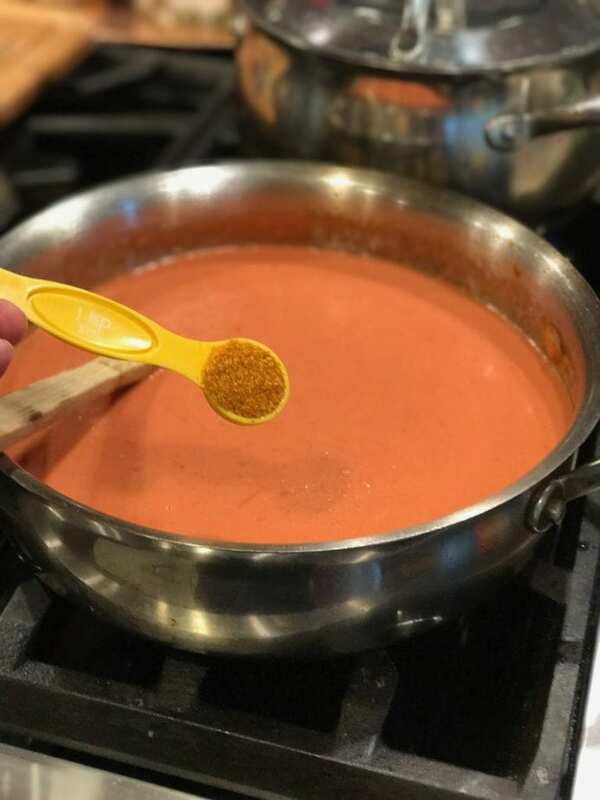 Scoop desired amount of vodka sauce over penne and stir until desired coating. 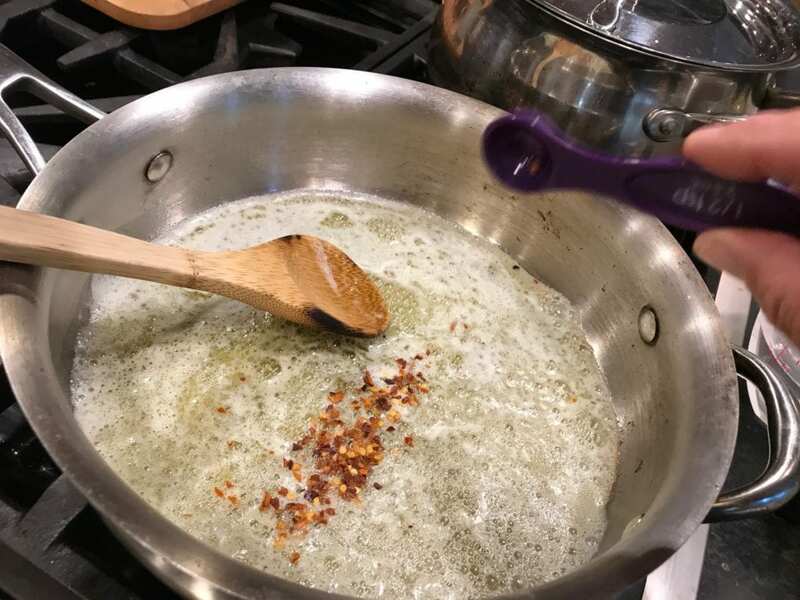 Toss in basil and parmesan, mix gently. 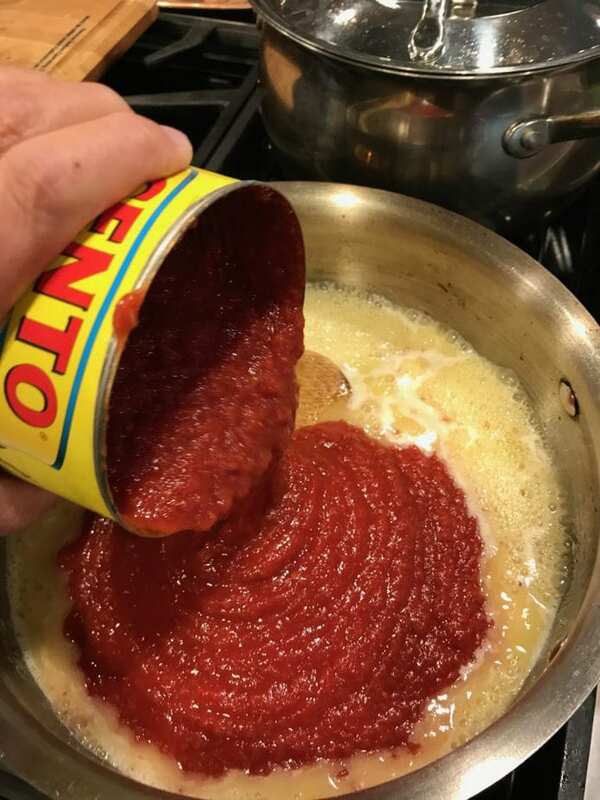 Serve immediately with fresh parmesan grated on top, along with a few grinds of salt and pepper if desired. Delicious served with crusty Italian bread, garlic bread and a crisp green salad. Copyright 2017 | This recipe for Penne alla Vodka first appeared on The Fresh Cooky. Looks wonderful as always! Can’t wait to make it! Love the picture of no. one son ? Lol! He was so hungry that night and I made him wait until I got pictures. Had to snap that one. Hope you love it!! Made this tonight for a “last minute-throw together-have people over” dinner. Fabulous and a huge hit! Makes me so happy, Natalie!! Thanks for sharing!